Zoomin is India’s one of the finest photo service. You can choose products from wide range of personalized photo products, Photo Books, Canvas Prints to gift someone or to have for yourself. Infact, you can get an order worth Rs 150 practically free. There is an offer running for 100% cashback (upto Rs 150) on your first Paypal transaction on Zoomin. Celebrate your memorable and special moments through photos. 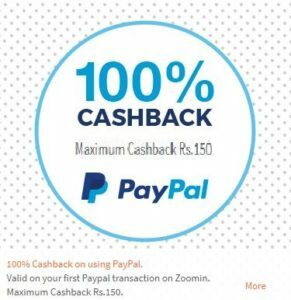 How to get 100% cashback (upto Rs 150) on your first Paypal transaction on Zoomin? 1. First of all, Download Zoomin App from here – Android or visit Zoomin here. 2. Now, Sign-in/Sign-up with your Email or Facebook account. 3. Choose from variety of products available in their catalog and personalize. 4. Enter your contact details, address etc. 5. Proceed to the payments page and select PayPal as the payment option to get 100% cashback in your PayPal account. 6. Done!!! Your cashback will be credited instantly. Pay with PayPal on Zoomin and get Rs 150 cashback on your eligible purchases. You will need to transact for a minimum value of Rs 50 on Zoomin to be eligible for the offer. Offer is valid only for first transaction on Zoomin through PayPal and can be availed once per user.